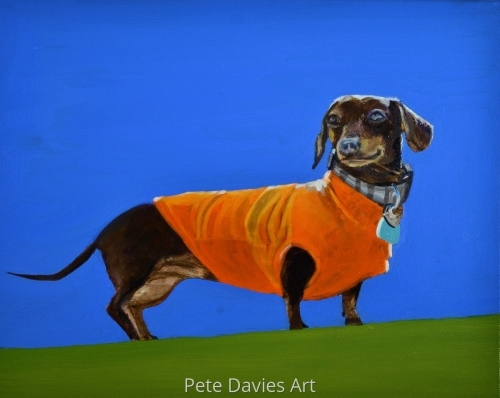 Pete Davies Art, affordable, inexpensive art prints , oil paintings and portraits. 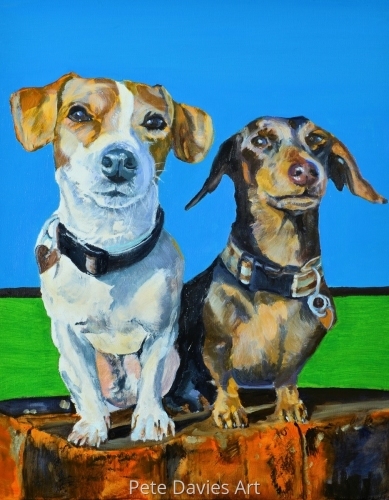 This is a painting of Cocoa and Poppy, the pets of a friend of ours. They are both young puppies full of life and interested in everything. I hope I have conveyed their keenness and excitement in their portrait. I am particularly pleased with the bright colours, sometime paintings just work out the way you want them to! 14.25" x 11"16.75" x 13"20.75" x 16.25"
This is our cat, Buddy, captured at the moment he realises he has been caught sitting on the best settee. I think it catches his expression well as he wonders whether I am going to get him to leave or not. 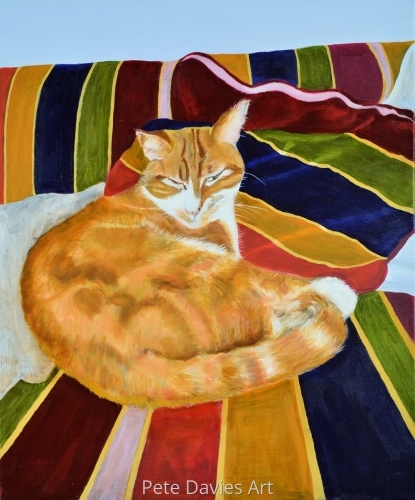 I was pleased with the painting of his fur and also the cushions on the settee. The original painting was painted in earth colours, browns and then white. 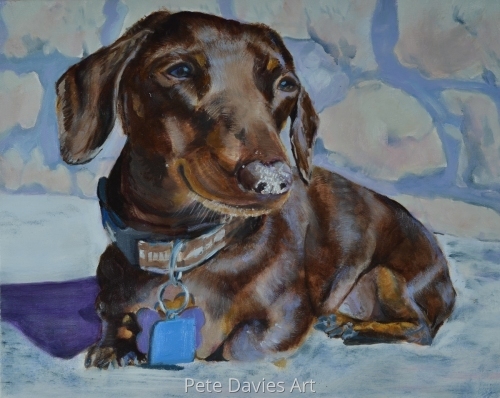 The colours for the settee and Buddy's fur, were then added as a series of glazes afterwards. Quite a laborious process but worth it. 13.25" x 11"20.5" x 17"24.75" x 20.5"
This is Cocoa resplendent in her new winter jacket. 11" x 13.75"13" x 16.25"17.25" x 21.5"
I started the painting as I usually do with oils, by painting in earth colors, burnt umber and raw umber, then adding white to emphasise the highlights. After that I added various glazes to produce the the fineness and color of Cocoa's fur. Sold to a private collector in Rome. 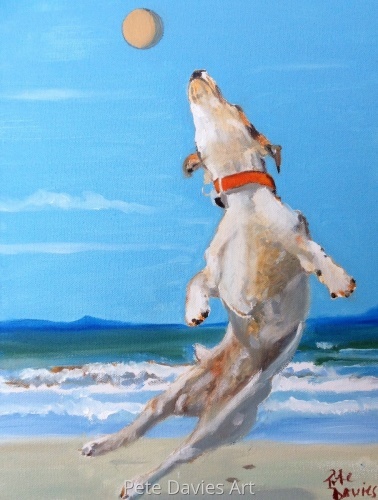 11" x 13.75"17" x 21.25"18.75" x 23.5"
This is a friend of ours Jack Russell puppy jumping and playing on Brighton beach. It expresses the idea of innocence and complete freedom and a desire to reach your goals no matter how unobtainable they may at first seem. 12" x 9"14.25" x 10.75"